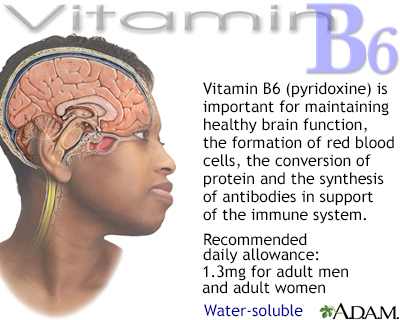 Vitamin B6 is a water-soluble vitamin. Water-soluble vitamins dissolve in water so the body cannot store them. Leftover amounts of the vitamin leave the body through the urine. That means you need a regular supply of these vitamins in your diet. Make antibodies. Antibodies are needed to fight many diseases. Make hemoglobin. Hemoglobin carries oxygen in the red blood cells to the tissues. A vitamin B6 deficiency can cause a form of anemia. Break down proteins. The more protein you eat, the more vitamin B6 you need. Keep blood sugar (glucose) in normal ranges. Fortified breads and cereals may also contain vitamin B6. Fortified means that a vitamin or mineral has been added to the food. The Recommended Dietary Allowance (RDA) for vitamins reflects how much of each vitamin people should receive on a daily basis. The RDA for vitamins may be used to help create goals for each person. How much of each vitamin is needed depends on a person's age and gender. Other factors, such as pregnancy and illnesses, are also important. Ask your health care provider which amount is best for you. 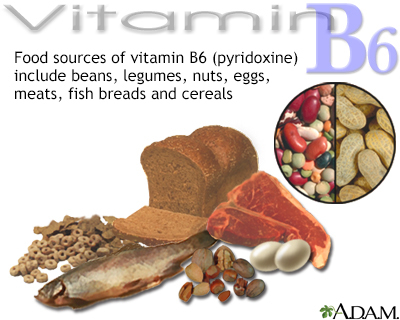 Pyridoxine, or vitamin B6, boosts the manufacture of antibodies to support the immune system. Large doses of B6 can cause numbness and neurological problems. Like most vitamins, vitamin B6 may be obtained in the recommended amount with a well-balanced diet, including some enriched or fortified foods.